It’s certainly a unique and unusual film, but there just isn’t enough happening for most of this movie. This is a pretty creative movie in terms of what it’s trying to do, but unfortunately creative and artistic don’t necessarily translate into interesting. Most of the movie takes place on the front lawn of Nick Halsey (Will Ferrell) after he has been laid off and also kicked out of his house. He proceeds to spend the next few days on the lawn, interacting with a few people who come by, every so often. Now there is more that ends up happening than just that, but it doesn’t really get started until the second half of the film. If the first half is all setup, and establishing the situation, then it is just too much time devoted to that. The second half definitely makes up for it, giving us all kinds of conflict and twists, and it makes us wonder what a different movie this would have been, had the first half taken the same kind of initiative. Everything must go is a very different kind of movie. It’s one of those movies where you watch the trailer and ask if the movie can really be only about this one thing. That’s not a movie that most people want to see, as it seems like the entire film will take place in one tired location. Luckily the movie isn’t nearly as predictable as it might seem. The trailer makes it look like a film that is only about a guy and a kid, hanging out on his lawn, having one large garage sale. I’m surprised the trailer depicted the film in this way, and never showed Rebecca Hall, for example. But the movie is definitely better than it looks. It still has plenty of flaws, but it also has many redeemable qualities. For one thing, Will Ferrell is playing it serious. Like some other actors who have come from Saturday Night Live, when Ferrell plays serious, he is pretty much at his best. He is wonderful here, just like he was in the black comedy stranger than fiction. Adam Sandler is another SNL alumn who gave his best performance since his breakout films when he tried his hand at serious material with punch drunken love. It doesn’t always work (I think Sandler tried to be serious in the movie, funny people, as well, and did not have the same success), but it certainly is a risk worth taking. Everything must go is a black comedy, but it borders on being a drama. That’s because it is a somewhat depressing movie about a laid off, miserable alcoholic. For anyone who has ever seen Bad Santa, we know that a character that has nothing to lose and is totally down on his luck, can actually be very funny. This movie takes it more seriously than some of those other movies (they seem to always star Billy Bob Thornton, whether it’s Mr. Woodcock, school for scoundrels, Bad Santa, or the ice harvest.) 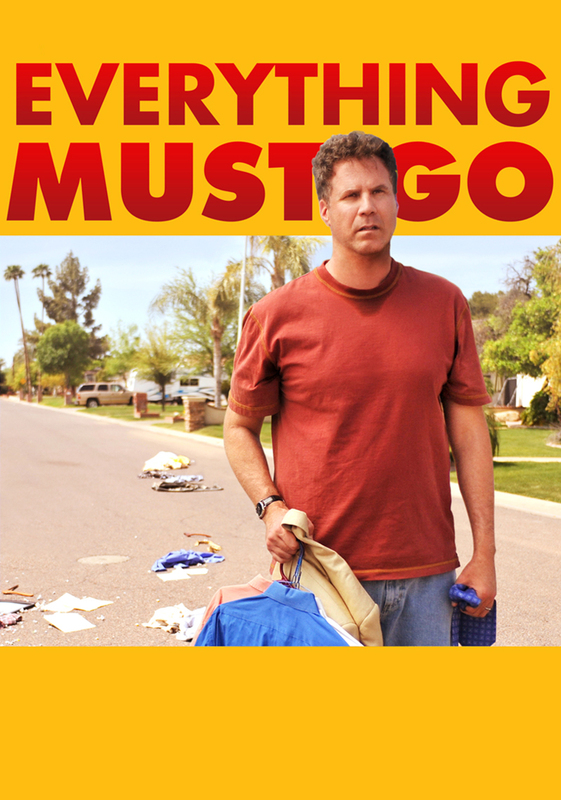 everything must go uses the same idea, and Ferrell often tells things like they are, holding nothing back, only it doesn’t always play these scenes for laughs. The story starts with Ferrell’s character, Nick Halsey, getting fired. There is talk about how much he drinks and how he had an affair with a woman at work and has been charged with sexual harassment. When Nick gets home, all of his things are out on the front lawn. He tries to open the door to his house; only the locks have been changed. And so he sits down in one of his chairs on the lawn, and just relaxes. He’s had too awful of a day to let anything else both him. I suppose there’s a sort of office space mentality to this reaction. Instead of screaming and yelling and maybe even breaking a window or breaking down the door, like a character in his situation might actually do, nick just sits down and takes some time to himself. He does say, “can this not happen today,” as he is knocking on the door, but other than that, he basically leaves his wife alone. That is assuming that she is in the house. We don’t know because we never see or hear her. We don’t actually see nick’s wife at all, in the entire movie. That’s something pretty cool about this film. It avoids the usual clichés of having them fight, and having the expected characters. Instead, the focus of the movie is on nick, the neighborhood kid who helps him sell his things, the attractive neighbor who lives across the street, Samantha (Rebecca Hall), and his friend and a sponsor, frank, who comes to check up on him from time to time (Michael Pena). A major problem with the movie is that it doesn’t exactly get going until it’s second half. I’m all for the idea of building up to something, and of a movie getting more exciting as it goes on, but does it have to get more interesting too? And does it have to do that at the expense of the first half, meaning make the first half kind of dull just so that the second half will seem much more enjoyable? That’s kind of what happens here. In the first half of the movie, nick is laid off, goes home, deals with the situation there, meets the kid, and hangs around on his lawn, selling things. If that first half is uneventful, then the second half is the exact opposite. Nick deals with every conflict and character in his life (except for his wife, of course.) he runs into his old boss in a restroom somewhere and gets some closure about the situation that got him hired. He has a very unexpected scene with Samantha, in which he is harsh and cruel to her, the way an angry drunk guy who is bitter about the world probably would be. And then there is a surprise ending that is totally unexpected. It’s not a great surprise or anything, but it’s certainly a lot more livelily than anything that came before it. By the end of the movie, we feel very different than we did during the first forty minutes or so. Whatever this crazy beast of a film was, it certainly work up and got itself together just in time. The movie definitely has some cool things about it, and I wish those ideas were delved into even more. Basically, every plot line is explored enough to make us interested, but not a whole lot more. The situation with nick and the woman at work who accused him of harassment, for example, is not explored enough. We don’t actually need any more than what the movie gives us, but it sure would have been interesting to get a flashback or two to what happened. There’s just so much that could have come in that first half instead of what they actually gave us (a scene of his boss catching him drinking at work or being drunk at a work party or something.) I like the movie for what it was, but it definitely could have been better.